There is a lot of excitement here at AMAUTA Spanish School in Peru as the World Cup is near, and, next month is the month of the Fiestas in Cusco. Every day is filled with fun as there is plenty to do for our Spanish students in Cusco, whether it be watching the football games or walking down to the Plaza de Armas of Cusco (just one block away from the AMAUTA school) to watch the parades. In the AMAUTA student residence – located within the centrally located school building – , the sound of distant drums and flutes reaches us from the main square constantly reminding us it is the month of June. 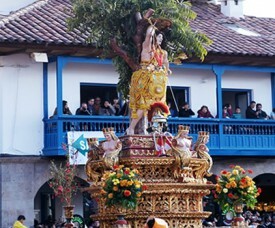 Now Corpus Christi is near, and on June 24th we are celebrating Inti Raymi.